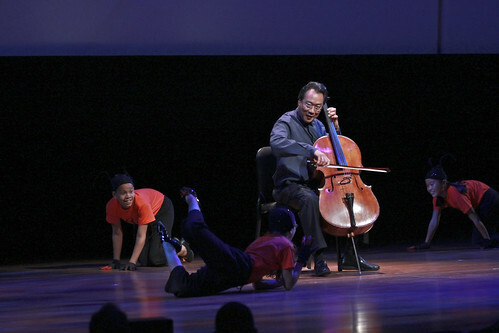 The second year of the World Science Festival got off to a spectacular start last night at New York’s Lincoln Center, with a program star-studded from both science and the arts. We loved it here at TED, not just because it featured so many of our TED favorites — physicist Brian Greene (who co-founded the Festival with partner Tracy Day), biologist E.O. Wilson, actor Anna Deavere Smith, Nobel winner James Watson, photographer Frans Lanting and cellist Yo-Yo Ma to name a few — or because we share a lot of cross-disciplinary DNA with WSF, or because it was held in the new Alice Tully Hall (designed by TED speaker Liz Diller) but also for the its fresh, innovative approach and playful sense of fun. 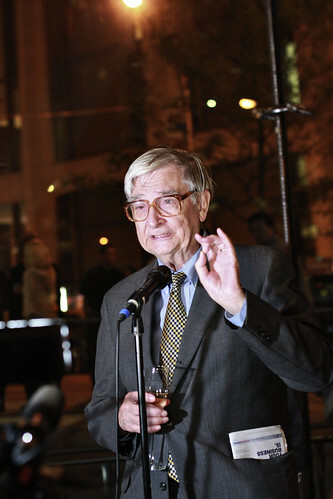 The evening paid tribute to legendary biologist (and beloved TED Prize winner) E.O Wilson, on the occasion of his 80th birthday, but the program was really a love letter to science itself — for its importance, yes, but also for the inspiration and wonder it offers, and for its deep but often-unacknowledged kinship with the arts. 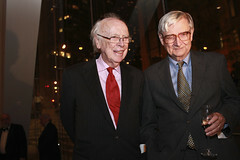 “Tonight, science and art, long-lost lovers, reunite” Alan Alda said, as he opened the show. And that sensibility pervaded the program, as it blended science and the arts in innovative and unusual ways — from a sequence of broadway musical stars singing light-hearted tributes to science (For example, a guided tour of the periodic table, set to the tune of Gilbert & Sullivan’s “I am the very model of a modern major general”. Brilliant!) to an intellectual pas de deux, featuring Brian Greene waxing eloquent on the nature of the universe, and Joshua Bell performing lyrically on the violin. READ MORE: The NY premiere of Frans Lanting’s LIFE, live performance of the Philip Glass score and Wilson’s central message. The centerpiece of the evening was the soaring New York premiere of Frans Lanting’s, “LIFE: A Journey Through Time.” The multimedia performance sets Lanting’s extraordinary images of the natural world to a Philip Glass score, performed live by the St Luke’s Orchestra and conducted by creative collaborator Marin Alsop. Lanting, a National Geographic photographer and poet on the side, presented an early version of the LIFE project at TED2005, and it’s extraordinary to mark its progress and evolution. LIFE is now a book and traveling exhibit, as well as a live performance. It captures the beauty and drama of the natural world through a choreographed collage of contrast and color, pattern and motion. A tiny gazelle at the foot of an elephant; a lion half-hidden in twilight grass; a dove soaring; a frog staring; insects, amoebas, volcanoes, sand dunes. Stunningly beautiful, it leaves the audience struck by both the unity and diversity of life.